WSL4 encodes a KCS6 protein which is required for cuticular wax accumulation in rice. Very long chain fatty acids (VLCFAs) are essential precursors for cuticular wax biosynthesis. VLCFA biosynthesis occurs in the endoplasmic reticulum and requires the fatty acid elongase (FAE) complex. The β-ketoacyl-coenzyme A synthase (KCS) catalyzes the first step of FAE-mediated VLCFA elongation. Here we characterized the Wax Crystal-Sparse Leaf 4 (WSL4) gene involved in leaf cuticular wax accumulation in rice. The wsl4 mutant displayed a pleiotropic phenotype including dwarfism, less tiller numbers and reduced surface wax load. Map-based cloning and nucleotide sequencing results revealed that wsl4 carried a single nucleotide substitution in the second exon of a putative KCS6 gene, encoding one subunit of the FAE complex for VLCFAs. Genetic complementation confirmed that the mutation in WSL4 was responsible for the phenotype of wsl4. 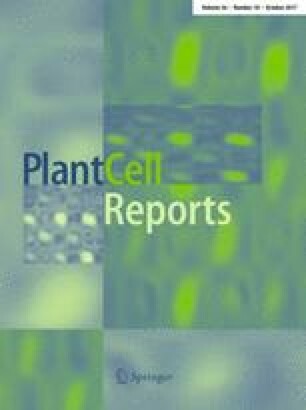 WSL4 was constitutively expressed in various rice tissues and localized in the endoplasmic reticulum. Both WSL4-RNAi transgenic lines and WSL4 knocked-out mutants exhibited wax-deficient phenotypes similar to the wsl4 mutant. These data indicate that WSL4 is required for cuticular wax accumulation in rice. Lu Gan, Shanshan Zhu, and Zhichao Zhao contributed equally to this work. The online version of this article (doi: 10.1007/s00299-017-2181-5) contains supplementary material, which is available to authorized users. This work was supported by the National Key R&D Program of China (2016YFD0100600, 2016YFD0200700), and the National Special Project of China (2014ZX08001-006).